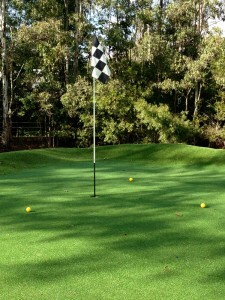 At the start of the year I put in a synthetic golf green at the Golf Farm. It has now become my pride and joy and I use it almost everyday (the only thing that stops me is the rain). I was apprehensive at first because the synthetic greens I’d seen in the past were terrible – not even close to realistic. But this puppy is awesome and if you’ve ever wanted a golf green in the backyard then this one comes with my highest recommendation. Synthetic grass has come a long way in recent times. 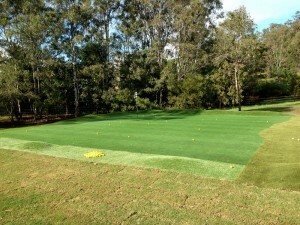 Many sports, like hockey and lawn bowls, have adopted this technology readily and the synthetic surfaces are part of their sport. Other sports have been slow embrace synthetic because earlier models of grass weren’t that flash – the surfaces were way too fast and friction burns were a constant issue. Improved surfaces have seen the popularity grow and I’m sure we’ll see more professional events played on fake surfaces in years to come. Golf provides some tricky challenges for the synthetic golf market. While it’s easy to produce a green that rolls really well (the manufactures claim that testing shows that synthetic greens roll better then the real deal) but when it comes to full playability, like spinning and stopping the ball, there has always been an issue. And this way my major concern when I started thinking about it – the two greens I had seen were so hard and fast that normal golf wasn’t possible. It just wasn’t possible to hit a lofted shot onto the green and be able to stop it. And I wasn’t interested in a “putting” only green, I wanted something that would allow me to hit all sorts of shots to it. I don’t think there’s a better synthetic golf surface available anywhere in the world. You really have to see it to believe how good it is. In the last few weeks I’ve had two golf professionals and a low single-digit golfer check it out and they were blown away at how well the green looks and plays. It’s as close to realistic as current technology allows. If I were to give you a percentage I’d say somewhere around the 90-95% mark. Some shots are so close to the real thing that it’s hard to tell any difference. The key with these greens lies with the base construction and the synthetic grass used. The base is built like a normal green and the goal here is to give the green firmness, drainage and impact dampening. And the real hero of the outfit is the yarn. It’s called Helix and it’s really tough while being soft at the same time. I could go on and on about Helix but I’ll spare you all the details – let me just say that it’s the only synthetic grass that has been designed specifically for golf – all other manufactures use hybrid varieties that come from hockey and/or lawn bowls. “Other” synthetic grasses give a trampoline effect to lofted shots. When the ball lands it will spring off and finish over the back of the green. But not Helix. It absorbs the energy of the ball on landing and in conjunction with the base construction (a process that Bruce has pioneered) the ball will come to a stop. It’s like a one-two punch! The best way to describe this green is like a firm sandbelt or championship green. These greens are firm underfoot while still allowing the ball to stop. It works a treat. Lofted shots don’t leave a pitch mark and the green surface stays true and smooth. I’ve hit thousands of shots onto my green and the thing is as good as it was the day it was put in. The other amazing thing is maintenance – there is hardly any. Unlike a normal green, there’s no mowing, watering or chemicals needed. All I need to do is give it the odd brush and a spray of Roundup (to kill the weeds that want to grow into it). This takes no more than 20 minutes every month or so. So there’s plenty of time for playing and not much work required. Just how I like it. There’s one other thing that I need to tell you about that’s vitally important. Synthetic greens need an infill added to them to weigh the green down (so it doesn’t blow away) and to give the green it’s speed. Without infill you’d have a really slow green, the infill allows the ball to run on top of the grass and not through it. Most installers use sand as the infill but this causes all sorts of issues. Ignore this advice at your peril. Sand works a treat in the early days but once it gets wet it becomes compacted. Once compaction happens the green becomes impossibly hard – almost like concrete and the only way around this is to give your green some major surgery. So the strongest recommendation I can give you is please don’t use sand. Bruce uses a product called Profill and as far as I’m aware, is the only guy using it. Profill is water resistant and therefor doesn’t compact and it greatly reduces maintenance time and increases playability. My green is as good today as it was 3 months ago thanks to the secret sauce, Profill. Note: Currently, I have my green running pretty quickly (about 11 on the stimpmeter) and I’m thinking of slowing it down a little so it matches the playing characteristics of the greens I’m now playing on. All we have to do it brush out a small amount of Profill and it will be good to go. 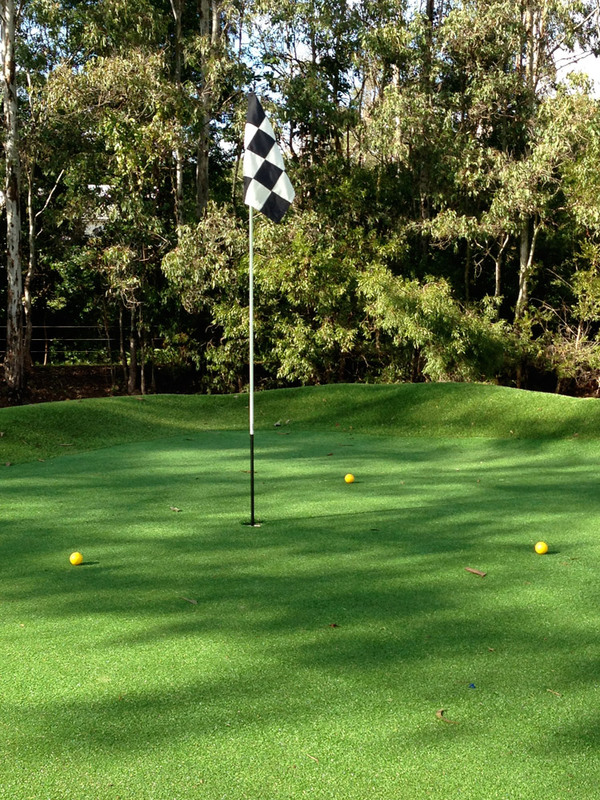 These greens require a serious investment (approx $135 per square metre) but they’re worth it in my opinion. A real green would cost just as much to install and with at least that much every year to maintain they’re not a viable option for most. I’ve had my eyes opened to the serious amount of work that goes into keeping a golf course in tip top condition. Synthetic grass technology is so good that I think that it will only be a matter of time before we see a full golf course decked out in synthetic (including fairways). The cost of the initial build would be a little higher, but you’d more than make up for it on the maintenance – synthetic grass doesn’t need to be cut all that often. I really could go on and on about this and will probably write more in future. If you would like more information please shoot me an email or leave your comments below. Please don’t rush out and buy something without speaking to me. 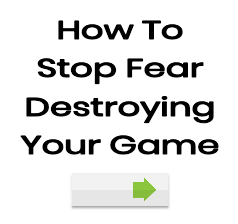 There are lots of potential mistakes that could trip you up. Full disclosure: I have been so impressed with Bruce and his team that I am now working with them as a consultant. We’re working on a booklet and website and will hopefully launch soon. You now know what I want for Christmas cam!